I have to share this with you. It has been nearly a week since we held our Two Wacky Women quilting retreat. Life has been a bit complicated for me as of late. However, this morning my daughter, Jolene who attended the retreat, texted me this photo. She finished her quilt top. 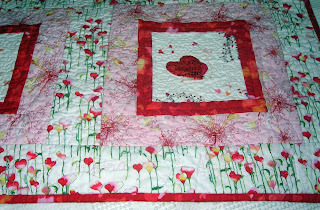 She used one of Billie Lauder's sample quilts as her example and made this very cute quilt top. 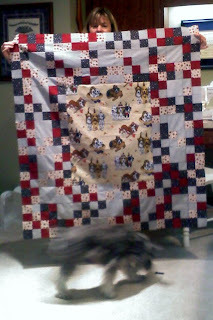 This adorable quilt is being made for Molly, the little schnauzer in front. I wonder, if after all this work, that will still be the case? She is headed out now for batting to complete her project. Jolene is not a new quilter. 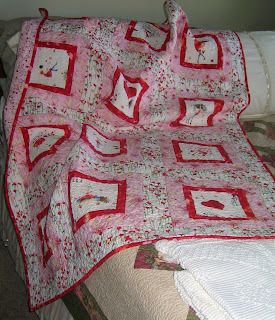 She has made a few scrappy, pull-from-the-sack quilts in the past. And, they turned out great. This is her first planned quilt. Don't you think it is wonderful? Good job Jolene. I finished this sample last night. I love sewing in the rain, don't you? Two Wacky Women are hosting their first quilting retreat of the year this weekend. It features Billie Lauder and we will have some new samples to share. 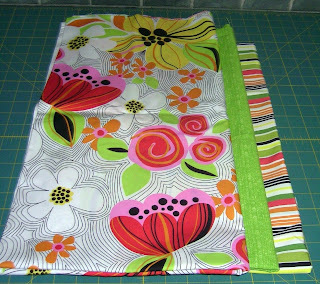 A few new quilts, a few new Letty's Bags as well as some new fun and wacky items. It may be raining; but, like I say, it's fun sewing in the rain. Just took this picture from my front porch. There is a parking strip somewhere there. We were issued a tornado warning here in Long Beach. 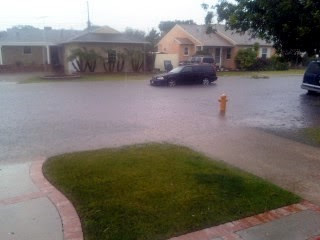 So forget the song "It Never Rains in Southern California". Now to get the dogs to go outside, yeah right. I am in the process of making more samples for Two Wacky Women. This trio of fabric is going to be another Simple Rails. 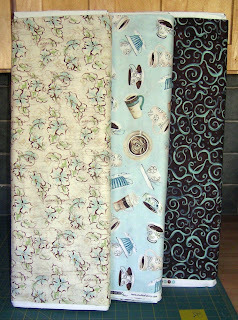 The fabric line is Deja Brew by Studio E. This is already pieced, pinned and waiting to be quilted. I can see it being used first thing in the morning with your first cup of coffee. Ahhhh. I have hopes that this will be finished soon. And this wonderful fabric is called Petal Punch by Hoffman International of California. Isn't it just wonderful? This is going to be a Magnolia Lane. Look at that wonderful strip for the binding. This will probably have to wait until I get home from the Retreat that Two Wacky Women are hosting next weekend. Check back later for this one. I finished another quilt. This is called Grandma Heart's Noelle. I found this fabric on a recent shop hop here in Southern California. And, I couldn't resist this fabric for a three-year old who is in love with pink. I think almost all three-year old girls are in love with pink. Frances Moore told us at one of her Machine Quilting Retreats, to let the quilt tell you how to quilt it. So, I did. And, believe it or not, it did talk to me. 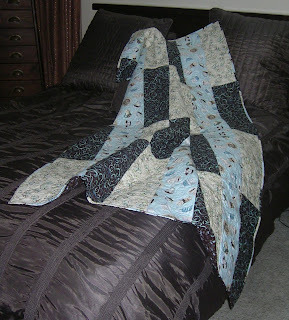 I had a great time with the quilting. If you click on the pictures, you can see what it told me. I even quilted the name of the quilt on it. I think Frances will be proud of me for listening. Several posts ago I talked about making this quilt. This one is NOT a sample. It was meant to be Christmas gift for my daughter in Florida. But, December got crazy when my mom fell and broke her hip and you can imagine what that has meant. Yesterday I finally finished it. I am calling this The Green Quilt. Not very original; however, it just seems right. It has been laundered and is ready to go. Tonight I will throw it on my bed and sleep under it; because, I want to send her my love along with the quilt. As you can see it is Trudy approved. This is what I did with the fabric I posted a few posts ago. It is called "Simple Rails" and, by the way, it is really simple. But, quite effective don't you think? It really is all about the fabric. Simple Rails is a good example of what you can do using three one-yard cuts of fabric. That is all it takes for a decent-size napping quilt. I even used up the bits and pieces for the binding. I found the backing in my stash (how very lucky for me). This is a free pattern you can find at http://www.twowackywomen.com/ In addition, Robin has a couple examples on her blog http://robingallagher.blogspot.com/. I hope you visit both sites and then go make that quick quilt you have been wanting to make for yourself or charity. Then send us a picture of your "Simple Rails". Do you remember your soft and cudly dolly? 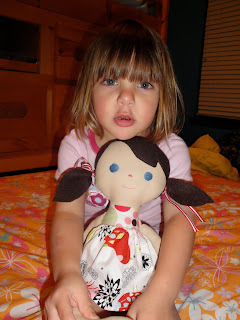 My youngest granddaughter, Noelle, received this adorable cudly doll for her third birthday. It was handmade by my dear friend, Khristina from Australia (http://sewprimkhris.blogspot.com/. Isn't it the most precious picture of both babies, I mean big girls?